New York City’s Education Department, in a break with the data-driven policies of former Mayor Michael R. Bloomberg, moved on Wednesday to reduce the role of standardized exams in deciding which students to hold back each year. Under the new policy, students in third through eighth grades would be judged on several criteria, including writing samples, grades and class projects. While test scores would also be considered in deciding which students should advance to the next grade level, they would not be the dominant factor, as they were under Mr. Bloomberg. Schools Chancellor Carmen Fariña said the policy was meant to ease some of the anxiety around standardized exams and to reduce the amount of time teachers spent preparing students for tests. 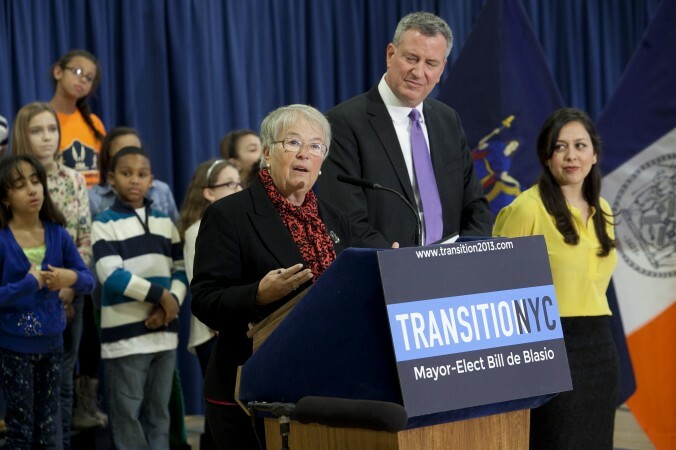 “This new way forward maintains accountability, but mitigates the unintended consequences of relying solely on a single test,” Ms. Fariña said in a statement. Education officials acknowledged that the proportion of students in grades three through eight held back each year would probably remain about the same — 2.5 percent, or about 8,000 students. The change is expected to be approved by an educational oversight panel in May. Mayor Bill de Blasio, in laying out his education agenda, has spoken often about his desire to reduce the importance of standardized exams. Ahead of state exams in English last week, education officials encouraged principals to work to reduce unease in class. And Mr. de Blasio has said he wants to broaden the admissions criteria for selective schools beyond test scores. Teachers and parents had been lobbying for a change in the promotion policy since last year, when the state adopted new exams aligned with more rigorous academic standards known as the Common Core. Test scores across the state plummeted; in New York City, 26 percent of students in grades three through eight passed the English exam, while 30 percent passed in math. Responding to the outcry, the State Legislature this month mandated that school districts take into account multiple measures in deciding which students to promote, and it barred schools from including test scores on student report cards. On Wednesday, union leaders and education advocates, who had long railed against Mr. Bloomberg’s use of data in decision-making, praised the change. “A child is more than a single test score,” said Michael Mulgrew, president of the United Federation of Teachers. But others criticized the change, saying it would allow subjectivity and leave students ill prepared for higher grades. “Our focus should be on ensuring high-quality instruction on the front end, not on changing the bar for promotion,” said Jenny Sedlis, executive director of StudentsFirstNY, an advocacy group. As mayor, Mr. Bloomberg championed one of the strictest policies on student promotion in the country, a centerpiece of his efforts to improve graduation rates. Under Mr. Bloomberg, students who scored at the lowest of four levels on the exams were recommended for summer school and given a second chance to pass the test. If they failed again, they were typically held back, though parents could appeal. The policy announced on Wednesday would end the second round of testing in August, and instead ask principals and teachers to decide whether a student should advance after reviewing his or her performance in summer school. Genevieve Stanislaus, principal of Life Sciences Secondary School in Manhattan, praised the move toward multiple criteria in evaluations. But she said principals would have to track the progress of each student carefully to guard against partiality. NextThe New York City High School Fair is happening!